I am getting the below error message while hits the service using Parasoft Virtual tool for the service (http://soaptest.parasoft.com/calculator-02.wsdl) and mock service as http://localhost:9080/glue/calculator . The number of licensed hits per day has been reached. Use a license with a higher limit, or wait until tomorrow when the per day limit has been reset to process additional requests. Kindly take a look and help me on this. Hi Swapna, the free Community Edition Virtualize does have a limit on hits per day. If you reach that limit you will have to wait until the next day, or buy a license with higher limit. What is your current hit count for your local server? You can check this by double-clicking the "Local machine" node under the Virtualize Server view. As @hzzz stated, it may be that you have reached the amount of hits your tool is currently licensed for. 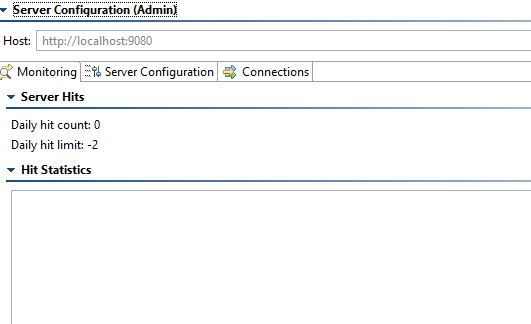 please find the screenshot for local server configuration as below. now can you tell me steps to proceed further on this. how do we know the parasoft Virtualize Licence is it installed in my machine? Do you use Parasoft Virtualize Community Edition? As @hzzz stated, Community Edition has a hit limit per day. You may want to check with your IT team about: the licenses your organization has, hit limits for these licenses, and about Parasoft License Server hostname, if used by your organization. If you are using local / machine-locked licenses, you may want to check "Using a Machine-Locked License" section on the page above. 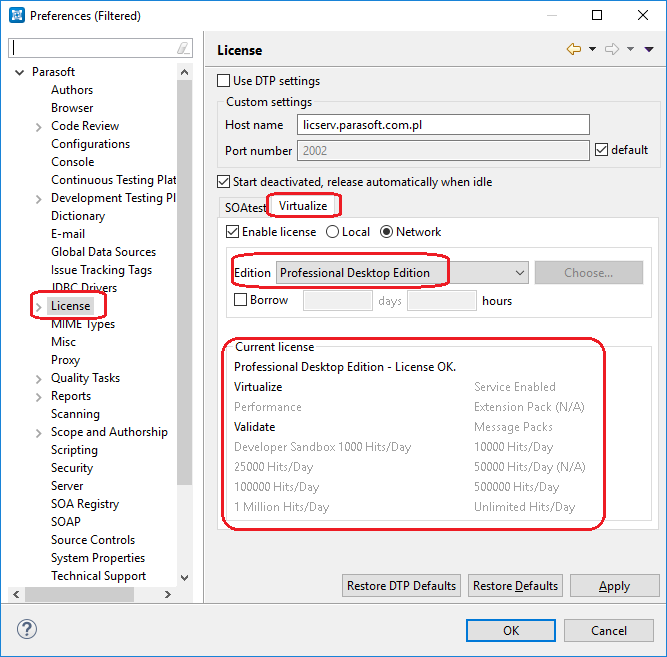 If you are using Parasoft License Server, go to "Using a DTP License" section. Thanks for your valuable explanation and followed the steps which you had specified and I am able to find the license details in my machine. I have deployed calculator wsdl in PARASOFT Virtualize successfully,But i am getting the below error message while calling the deployed endpoint? Could not find a valid Message Responder to respond to this request. Be sure you have a Message Responder with correlation criteria that match this message. Without being able to see what's going on, it sounds like you're sending in a blank and/or a GET request into the virtual asset. By default, the calculator wsdl that you used requires a specific SOAP request to send a valid response. If you have SOAtest or some other API testing solution, I would recommend trying to creating a test from the same wsdl and changing the endpoint so that it points at the virtual asset instead, or creating a custom virtual asset that has a fixed response. I did read the above messages and confirmed that Im using the "Developer Sandbox edition which shows 25000 hits/day, however when try to hit the virtual service, I'm seeing the same error pertaining to licensing , stating "The number of licensed hits per day has been reached. Use a license with a higher limit, or wait until tomorrow when the per day limit has been reset to process additional requests. ", kindly assist on how to get this resolved.